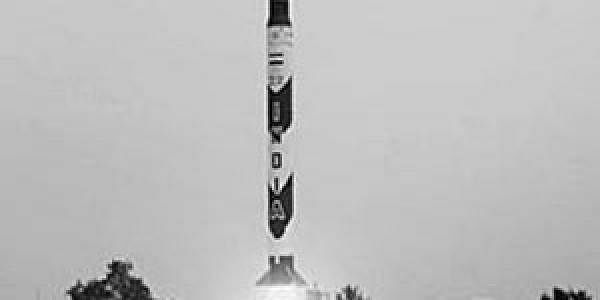 WHEELERS ISLAND: In a setback to the country’s nuclear counterstrike capability, the first ‘trainer-user-trial’ of intermediate range ballistic missile (IRBM) Agni-II has reportedly failed to deliver the desired results. The trial was conducted from Wheelers Island, part of the Integrated Test Range (ITR), off Orissa coast at about 10.06 am today. Reliable sources at the Wheelers Island said the countdown was normal, liftoff was smooth and then disaster struck as the 2000-km plus range Agni-II missile instead of travelling on the pre-determined trajectory started wandering midway. ‘‘The missile deviated from its path after the first stage separation and was meandering at an angle of 180 degree midway. Though it was coordinated to cover a distance of nearly 2000 km, within just 127 seconds it covered 203 km before plunging into the sea,’’ said the source. ‘‘The guidance system can correct the missile’s midway path deviation if it behaves erratically at an angle of 40 to 60 degree but not beyond that,’’ said a defence scientist. ‘‘The disaster might have happened due to design and manufacturing faults,’’ he added. Several attempts to contact ‘Agni project’ director Avinash Chander and ITR director S P Dash turned futile. There was no official word even from DRDO on the test. ‘‘We are still analysing the statistics about the flight performance and data from the launch pad and the three tracking stations are being thoroughly examined,’’ said a scientist, who is part of the missile programme. Several defence analysts have criticised the DRDO for the failure. ‘‘Agni project is an established project. In the deployment stage if the missile behaves like this, can we afford to hold the country to ransom security-wise. There should be some sort of accountability from scientists doing the research and development of the DRDO,’’ said an analyst. This missile is part of the Integrated Guided Missile Development Programme (IGMDP) and other missiles in the Agni series including 700-km range Agni-I and 3,500-km range Agni-III. While Agni-I has been inducted, Agni-III is on developmental trial.